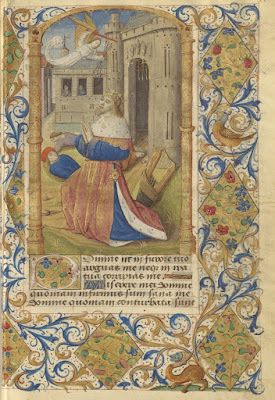 In his Life of St Augustine, St Possidius of Calama writes that in his final illness, the great doctor “had ordered the Psalms of David, those very few which concern penance, be written out; and lying on his bed … read the four of them (from the pages) attached to the wall, and wept copiously and continuously.” (chapter 31) He does not say which four these were, but we may safely assume that Psalm 50, often known by its first word in Latin, “Miserere”, was included among them, long recognized as the penitential psalm par excellence. 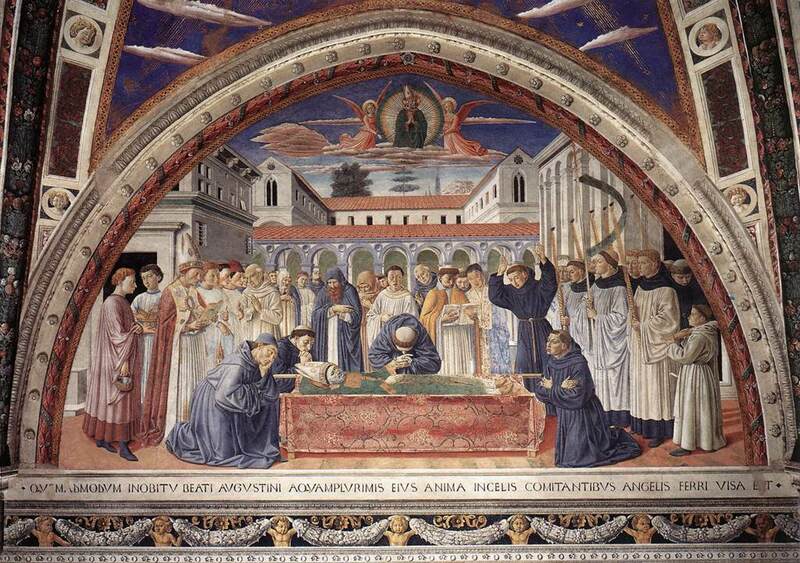 The Funeral of St Augustine, by Benozzo Gozzoli, 1465, in the church of St Augustine in San Geminiano, Italy. Of course, they are particularly prominent in the liturgy of Lent. 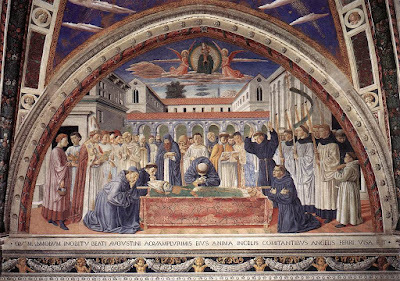 The customary of the Papal court known as the Ordinal of Innocent III (1198-1216) prescribes that they be said after Lauds every ferial day of Lent, together with the Litany of the Saints. To these were added the fifteen Gradual Psalms (119-133) before Matins, and the Office of the Dead, a burden which unquestionably increased the temptation to add more Saints to the calendar, since these supplementary Offices were routinely omitted on feast days. The Breviary of St Pius V distributed them over the days of the week, so that the Office of the Dead would be said on the first ferial day of each week of Lent, the Gradual Psalms on Wednesdays and the Penitentials on Fridays, if the Office was of the feria. This remained in force until the reform of St Pius X, in which all mandatory recitation of them in the Office was abolished; the Gradual and Penitential Psalms are not included as specific groups in the post-Conciliar Liturgy of the Hours. The Use of Rome, with characteristic simplicity, simply recites the Psalms as a group with a single antiphon, based on the words of Tobias 3, 3-4: “Ne reminiscaris Domine delicta nostra, vel parentum nostrorum: neque vindictam sumas de peccatis nostris. – Remember not, Lord, our offenses, nor those of our forefathers, nor take Thou vengeance upon our sins.” In other Uses, the antiphon was followed by a series of versicles like those sung with the Litany of the Saints, and various prayers; this custom was highly developed in German-speaking lands, less so elsewhere. 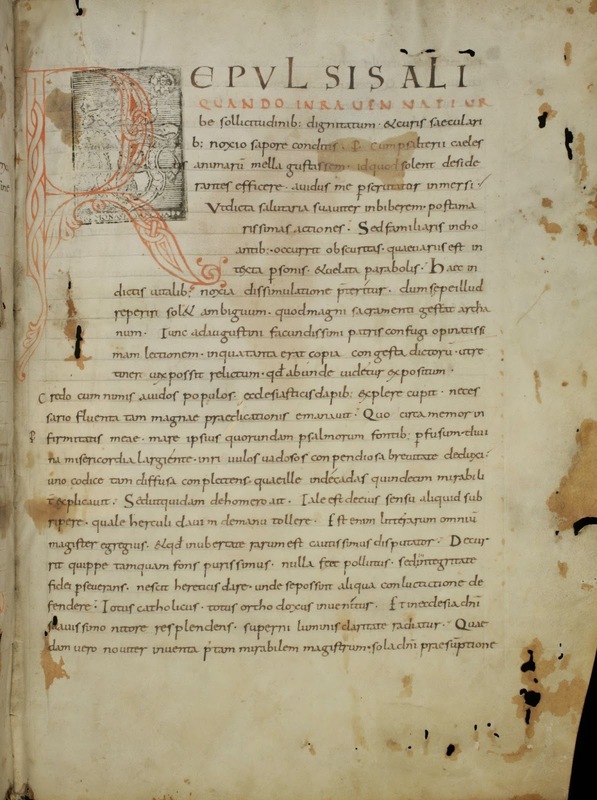 At Augsburg, for example, each day of the week had a different collect to conclude the recitation of the Penitential Psalms; the prayer for Monday was as follows. “Deus, qui confitentium tibi corda purificas, et accusantes se ab omni vinculo iniquitatis absolvis: da indulgentiam reis, et medicinam tribue vulneratis; ut percepta remissione omnium peccatorum, in sacramentis tuis sincera deinceps devotione permaneamus, et nullum redemptionis æternæ sustineamus detrimentum. 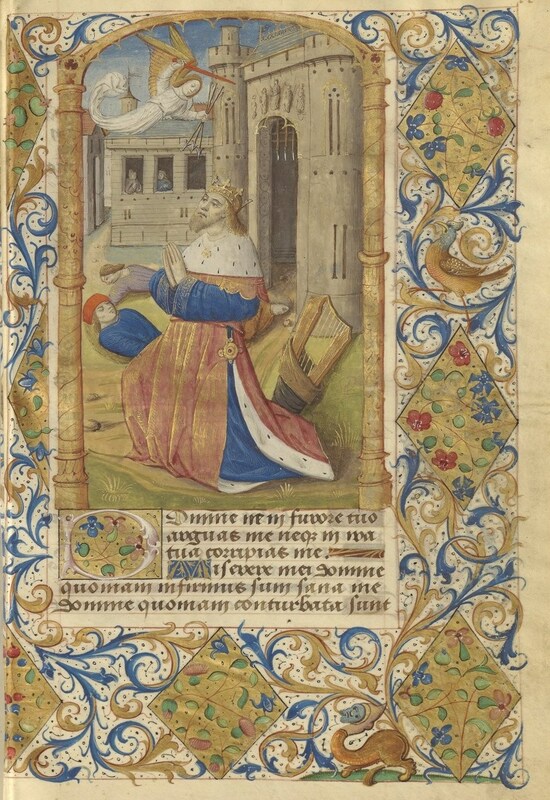 At Salzburg, the intentions for reciting the Penitential Psalms were summed up in the following prayer, attested in a few other breviaries and books of hours. “Suscipere digneris, omnipotens Deus, hos septem psalmos consecratos, quos ego indignus et peccator decantavi in honore nominis tui, et beatissimæ Genitricis tuæ Virginis Mariæ, in honore sanctorum Angelorum, Prophetarum, Patriarcharum, in honore sanctorum Apostolorum, in honore sanctorum Martyrum, Confessorum, Virginum et Viduarum, et sanctorum Innocentum, in honore omnium Sanctorum, pro me misero famulo tuo N., pro cunctis consanguineis meis, pro omnibus amicis et inimicis meis, pro omnibus his qui mihi bona et mala fecerunt, vivis et defunctis: concede, Domine Jesu Christe, ut hi psalmi proficiant nobis ad salutem et veram pænitentiam agendam, et vitam æternam consequendam. The Penitential Psalms were also generally used at the beginning of Lent, at the ceremony by which the public penitents were symbolically expelled from the church, and again on Holy Thursday, when they were brought back in. 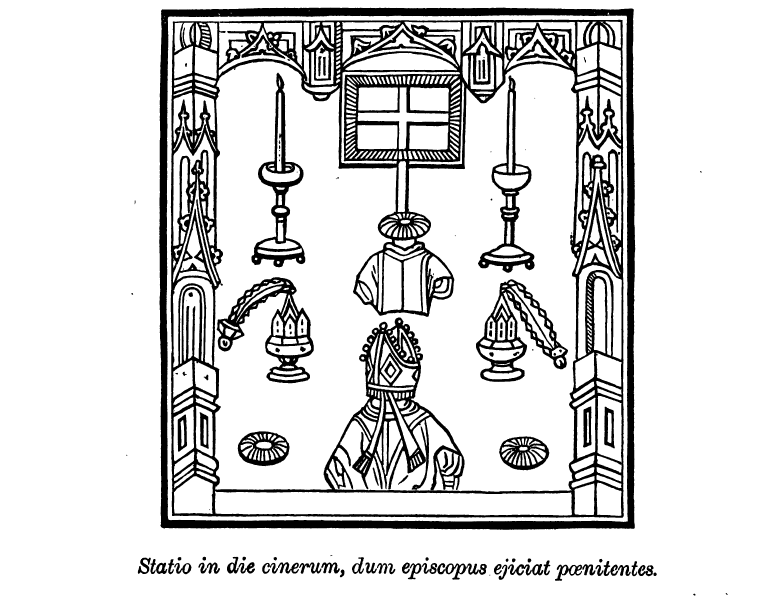 These ceremonies were particularly elaborate in the Use of Sarum, but similar rites were observed in a great many other places. After Sext of Ash Wednesday, a sermon was given; a priest in red cope, accompanied by deacon, subdeacon and the usual minor ministers, then prostrated before the altar, while the choir said the seven penitential psalms. At the end of these were said a series of versicles and prayers, most of which refer directly to the public penitents. “Dómine Deus noster, qui offensióne nostra non vínceris, sed satisfactione placaris: réspice, quæsumus, super hos fámulos tuos, qui se tibi gráviter peccasse confitémur: tuum est enim absolutiónem críminum dare, et veniam præstáre peccántibus, qui dixisti pænitentiam te malle peccatóris quam mortem. Concéde ergo, Dómine, his fámulis tuis, ut tibi pænitentiæ excubias celebrant; et correctis áctibus suis, conferri sibi a te sempiterna gaudia gratulentur. 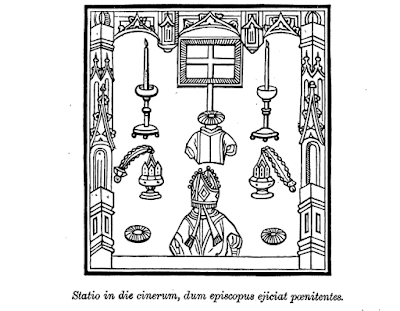 The ashes were then blessed, followed by a procession, which, as I noted in an article last week, was a normal part of the Ash Wednesday ceremonies in the Middle Ages. The Sarum Processional specifies that a cross was not used, but an “ash-colored banner” was carried instead at the head of the procession. At the door, the penitents were taken by the hand, and led out of the church, while the following responsory was sung, reprising an ancient theme of meditation on the Fall of Man in the readings of Genesis in Septuagesima. On Holy Thursday, when the penitents were brought back into the church, usually referred to as their “reconciliation”, the process was reversed, again by a priest in a red cope, accompanied by the various grades of ministers and the ash-colored banner. This ceremony deserves its own post, which I shall do on Holy Thursday; suffice it therefore to note here that the penitential Psalms are said again before the final absolution is imparted.